But the new dictum is PREVENTION IS THE BEST CURE. “ Fitness, Nutrition with Balance diet and Hygiene” Constitutes best Health for any person. Keeping the above philosophies in Health I developed new concept which is beneficial to the Indian Population, particularly to the rural and tribal Indian population. The new concept of Health in the 21st century is Fitness, Nutrition and Balanced diet associated with Hygiene is called the real Health. As the cost of Health care skyrocketing every day, it is better to have complete Preventive and if necessary curative system which is nothing but of Integrated approach(combination of different approaches to get good health). It is practically impossible to any government to provide the corporate level high-tech medicine to all the 75% of 120 billion rural population in India. Therefore a better method, a curative method, a rejuvenating method and a fully keeping fit procedure and preventing many health care problems come into the picture what I Call “Integrated Health and Medicine” or Alternative Medicine. In My approach I am not neglecting the Conventional Medicine which is used for Medical Emergencies. Therefore I am fulfilling the American Cancer societies’ approach. Medical disciplines that integrates the therapies of the collective knowledge and practiced by mainstream medical practitioners to treat the sick what will give Health care. Any therapy that is typically excluded by conventional medicine, and that patients use instead of conventional medicine, is known as “Alternative Medicine.” It’s a catch-all term that includes hundreds of old and new practices ranging from Ayurvedic Medicine to Homeopathy to iridology. Generally Alternative therapies are closer to nature, cheaper and less invasive than conventional therapies, although there are exceptions. Some alternative therapies are scientifically validated, some are not. An alternative medicine practice that is used in conjunction with a conventional one is known as a “complementary” medicine. Example: using ginger syrup to prevent nausea during chemotherapy. Together, complementary and alternative medicines are often referred to by the acronym CAM. IM combines mainstream medical therapies with non-conventional complementary therapies. However, IM only uses complementary therapies for which there is some high-quality scientific evidence of safety and effectiveness. In short, IM utilizes all appropriate, evidence-based therapies to achieve health. This common sense but scientifically rooted concept is catching on with the American public, who now partner with their family physicians to include evidence-based, non-conventional treatments (IM) in their healthcare regimes. Practice of IM has become so credible that the American Hospital Association states that more than 16% of hospitals, including leading medical facilities at Harvard, Mayo, and Duke, feature IM centers as part of their institutions. Among hospitals not currently offering IM, 24% stated that they planned to do so in the future. So are there distinct differences between this “new medicine” (IM) and its forerunners, alternative or complementary medicine? Yes. The National Center for Complementary and Alternative Medicine (NCCAM) defines complementary and alternative medicine (CAM) as “a group of diverse medical and health care systems, practices, and products that are not presently considered to be part of conventional medicine.” While some scientific evidence exists regarding some complementary and alternative therapies, many still require well-designed scientific studies to definitively answer questions about safety and efficacy. Complementary medicine is used together with conventional medicine. An example of a complementary therapy is using aromatherapy to help lessen a patient’s discomfort following surgery. So although IM utilizes complementary therapies, the stringent requirement that these treatments have a solid scientific basis exists, making it “once removed” from complementary or alternative systems. However, many practitioners and patients look forward to the day when the practice of using all evidence-based methods becomes commonplace and the IM designation is no longer required. It’s also important to note that IM, like most healthcare systems, is more than simply a list of treatments or therapies. IM values all aspects of a person’s health – mind, body, and spirit – and reaffirms the importance of an open relationship between practitioner and patient. Those who practice IM consider a patient’s overall satisfaction with life, pointing to irrefutable proof that stress management and good mental hygiene positively affect healing and health. Finally, instead of focusing solely on curing disease and illness, IM also emphasizes preventing disease and/or living well with chronic disease. Integrated Health and Medicine is an art of different disciplines incorporated to fulfill the need of the patients for a successful relief, cure and well being of an individual. This new concept of different disciplines of Health measures what are available are incorporated what we call an ALTERNATE MEDICINE. As conventional Medicine is used widely in the present world and its stoppage limiting to cure for some diseases and the sufferers are looking for alternative avenues where Alternative Medicine or (complimentary) Medicine emerged into the present world. Alternative Medicine emphasis that disease is due to the result of physical, emotional, spiritual, social and environmental imbalance and should be corrected to attain the final result what we call THE CURE. This integrated Medical disciplines are now widely used in the present world. 40% of the world population is looking into these disciplines after the limited result achieved by the conventional ( allopathic) medicine. Disciplines of Integrated Health and Medicine has its roots in several ancient healing traditions that stress healthy living and being in harmony with nature. In this aspect this sounds like Holistic medicine but the concept may look same but the approach of treatment modalities are different. In this Alternative or Integrated Health system the above said Fitness, Nutrition and Hygiene with Health education and Promotion are focused mainly and lacking in Holistic Medicine. In the Holistic approach like the conventional medicine it is costly matter for the person who is suffering in length as well as burden on the Government, family and the insurance companies. The main idea of introducing the integrated Health is to Give better and quick cure as well as to Reduce the Health care cost. More over the scientific evidence is more in Integrated Health system/ Alternative medicine rather than Holistic approach. Socrates promoted a different approach. Plato was another advocate of completeness, advising doctors to respect the relationship between mind and body. Hippocrates emphasized the body’s ability to heal itself and cautioned doctors not to interfere with that process. All these great persons are right when they Spoke in the BC ( 427, 460 and 467 BC.) I am not debating the basic principles what they observed and worked in their epoch. From those olden days to now majority of science is changed and new Technologies are developed in Health care sector which is easing the identification of the disease process and at the same time the treatment part also changed for the betterment. In spite of new methods applied in Medicine many disease are not completely cured because one discipline of Medicine is not able to cure all human suffering, where one of the other discipline having the capability to cure that Particular disease. 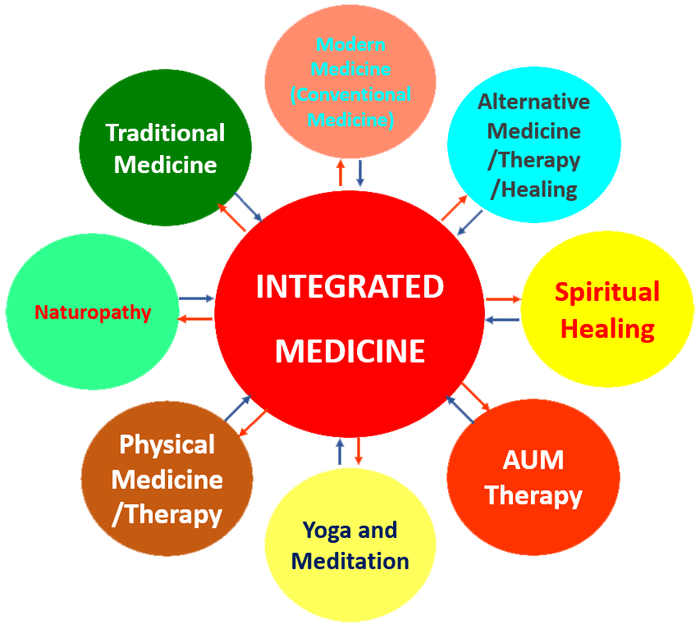 In Integrated Health and Alternative medicine is THE COMBINATION OF HEALTH DISCIPLINES are incorporated what are totally different from Holistic Medicine. The above two words appears similar but the difference may be recognized before one can look into Integrated Health. Alternative Medicine and Holistic Medicine look alike but not. There are differences between the two entities. In-depth studies proved that these two disciplines are different by practice. In Holistic Fitness, Nutrition and Hygiene are not discussed. Holistic Medicine opposes Conventional Medicine, but Alternate Medicine utilizes conventional Medicine when ever needed and part of it. In Holistic Medicine the procedures varies from doctor to Doctor but in Alternative Method the procedures are almost same. In Alternative Medicine these three components, Fitness and Nutrition and Hygiene are mainly focused along with Therapy procedures, but in Holistic Medicine the procedures are different as by the Physician can think. Alternative Medicine is Practiced by qualified persons, but Holistic Practice is by Quakes without proper degree or with Fake Degrees. Alternative Medicine is not much bothered about spirituality and leave this to the discretion of the person but Holistic medicine is more spiritual approach than scientific. In Holistic majority treatments are not proved scientifically but in Alternative Medicine most of the proven treatments are established. In Holistic certain planned programs or methods are followed irrespective of the outcome because of this the cure rate is delayed or the final goal may not be reached, but in Integrated medicine if the response is not appropriate the direction of the treatment plan is changed to another discipline without wasting time. Alternative medicine is more preventive and curative, but in Holistic preventive measures are zip to zero and curative basis by applying medicine from the very beginning. In holistic approach is aimed at cure but outcome is uncertain, where in integrated system the outcome of cure is eminent. Dangers Often holistic healers will convince their patients to forgo proper medical care, usually combined with misrepresentations of studies or emotional appeals, to undergo holistic therapies. Since there is no valid evidence to support holistic therapies being capable of curing deadly ailments, this kind of malpractice is dangerous to offer patients. In some of the disciplines of Integrated Health the treatments are not yet proven scientifically and this mission aim is to do research in such disciplines of particular cases. Though scientifically not commenced the proven work, but in practical these remedies proved. Such kind of one medication I have tested in US Lab and proven for HIV/AIDS, and further studies needed on human clinical trials. In the Integrated System of Health Medicinal part comes in the latter stage than in the starting phase. Human body have the capacity to RE JUVINATE once the system itself is allowed to remove the etiological factor or factors and restore the normal Physiological functions. As India touched 120 billion Population and most of them are living in the rural villages, so they have no proper Health care system as well as this population cannot afford the corporate hospital treatments. The middle class Family person admitted in the corporate Hospital and once he/she came out of the hospital, the Middle class family turns to poor. The corporate Hospital are increasing the price tag day after day and it is practically impossible for most of the families to afford once they are sick. In his Recent Speech his Excellency Governor of AP state Sri. Narshiman, commented about the charges collected by the Hospitals and the Doctors. Fitness plays an important role in the Human Health. This truth everyone agrees but to implement this program in the schools, colleges and Universities there is no mandatory rule Therefore I urge the authorities and Law makers to make the Law that sport and game and in turn fitness should be make mandatory in all the educational institutions. PresidentDwight D. Eisenhower was the 34th president of the United States who made mandatory law for school physical fitness program immediately after he was elected president of USA in 1957. This kind of Legislation is needed in Indian school system that all our school going students are fit and having good Health. Fitness is the part of Health. But Unfortunately the Private schools are not caring physical fitness and limiting the students for their class rooms and grinding them for their institutional ratings. ( Population 50,000 ) with all the needed infrastructure. Massag Therapy for better circulation. Energy products consumed are to Enhance cell Energy. Finally Women and child Health what is very poorly developed in the Rural India. These above components all together form Integrated or Alternative Health Care system. B)A Fitness centre with proper equipment. C)A senior Citizen Home to accommodate 10 persons in each centre. D)All the disciplines of Health Care are incorporated in this centre with needed infrastructure..( all 15 items written above). In alternative medicine, it is believed that the spiritual aspect should also be taken into account when assessing a person’s overall well-being. Few items focuses on how the physical, mental, emotional, and spiritual elements of the body are interconnected to maintain wellness, When one part of the body or mind is not working properly, it is believed to affect the whole person, but what discipline of medicine should be adopted is not known before but This Integrated Health specifies the selection of the sub sect of the list mentioned in this presentation. This approach differs from Holistic approach in treatment point of view. Available scientific evidence does not support claims that IM, when used without mainstream or conventional medicine, is effective in treating cancer or any other disease. However, many health professionals promote healthy lifestyle habits such as exercising, eating a nutritious diet, not smoking, and managing stress as important in maintaining good health. Alternative Medicine methods are becoming more common to adopt into the mainstream care and may be used as complementary therapy or preventive care. In Mainstream Medicine, an Alternative approach generally means a more inclusive approach to a person’s health by Life style, one that includes the patient’s social and cultural situation as well as his or her illness. This term Alternative is used to reflect a focus on a person’s overall health, a focus that includes prevention, fitness, Nutrition, rehabilitation, and other approaches, rather than illness alone. Nurses, for example, may speak of the “bio-psychosocial sphere” of a patient. This means that a person’s health includes the mind, body, and spirit, as well as the surrounding culture and environment. This can include one’s family situation, housing, employment, insurance, and more, since these all have an impact on the patient and his or her health. If all these factors are taken into account when a person is treated for cancer, it may make treatment easier and improve chances of success. Alternative medicine approaches health and disease from several angles. The approach suggests that a person should treat not only the illness but the whole self to reach a higher level of wellness. For example, practitioners may treat cancer by changing diet and behavior and adding social support groups and counseling. Others may suggest taking botanical supplements and using complementary therapies, such as art therapy, hypnosis, imagery, meditation, psychotherapy, spirituality and prayer, and yoga. These approaches can be used with conventional medical treatments such as chemotherapy, surgery, radiation therapy, and hormone therapy. Combining these different methods can help a person take control of his or her situation and attain a feeling of total wellness –Fitness, Nutrition, Cell energy enhancement, spiritually, and boosting Psychological strength. The field of Alternative Medicine is very diverse and broad. Some providers define it looks like Holistic as including emotional and spiritual care, but none of them are not in the reachable in the range of Alternative methods of treatment .while others focus on these aspects to the exclusion of the physical. There are many different techniques and approaches in holistic medicine, depending on the practitioner, the person, and the illness, however, stress the use of treatments that encourage the body’s natural healing system and take into account the person as a whole. The use of conventional and alternative therapies but focuses mostly on lifestyle changes. In this approach to stomach cancer might include reducing sodium intake, increasing intake of antioxidants through food or vitamins, eliminating Helicobacter pylori (type of bacteria found in the stomach), quitting smoking, improving oral hygiene, avoiding foods that contain geno-toxic agents, and increasing the amount of vegetables and fruits consumed. In this Alternative Medicine Therapy we can also include natural supplements that cause the same changes as conventional drugs. For instance, synthetic interferon is currently used to treat some people with cancer, but to take high doses of intravenous vitamin C instead, in an attempt to stimulate the body’s production of its own interferon. The Healthy lifestyle habits will improve a person’s energy and vitality. Those habits might include exercising, eating a nutritious diet, getting enough sleep, learning how to breathe properly, taking antioxidants and supplements, and using acupuncture, acupressure, healing touch, cranio sacral therapy, yoga, qigong, and other methods. The Physician in this system recognizes that our discomforts or pains are merely symptoms of an imbalance. The imbalance from the external Environment and internal Environment. This Imbalance is Balanced the person should not get any disease. could be a physical issue, the result of abusing the physical body through an unhealthy diet, lack of exercise, or too little sleep. Or, the imbalance may be the result of mental, emotional, or spiritual needs not being met. No aspect (mind, body, spirit, or emotions) of a person is overlooked when this treatment is sought. Although there has been research on various Alternative methods that may be considered part of a holistic approach, scientific research generally does not focus on holistic medicine by itself as a cure for cancer or any other disease. Available scientific evidence does not support the idea that alternative practitioners are more effective than conventional physicians in persuading their patients to improve their lifestyle. Nor have available scientific studies shown that any of these approaches are effective or cost-effective against any disease if holistic methods are used without conventional medical treatment. Some health care professionals suggest that cancer pain and some side effects of treatment can be managed with a holistic approach that includes the physical, psychological, and spiritual factors involved with each person. Increasingly, the health care team comprises a diverse and varied group of health care professionals. Members of this team are drawn from the specialties of medicine, nursing, surgery, radiation therapy, oncology, psychiatry, psychology, and social work. In addition, the team may call on dietitians, physical therapists, and the clergy for support. Health professionals realize that a person’s health depends on the balance of physical, psychological, social, and cultural forces. However, available scientific evidence does not support claims that holistic medicine alone can cure illness. Alternative are terms used to describe a number of products, practices, and systems that are not part of mainstream medicine. They can include things like herbs and dietary supplements, body movement, spiritual approaches, pills, extracts, and creams or ointments. Some are done by a person with formal education and training, such as art or music therapy. Others may be recommended by the person who is selling the product in a store or online, such as botanicals and exotic types of juice. The methods can involve everything from enemas, like colon therapy, to no-touch “energy work”. Some take a lot of time or cost a lot of money, such as strict diets or travel to another country for special treatments. Others are fairly cheap and easy to use, like vitamins or homeopathy. Some can be done at home on your own, such as meditation and prayer, and others require another person to give them, like massage or acupuncture. Some almost never cause harm, while others can be dangerous and have even caused deaths. You may hear about one or more of these treatments from friends, family, co-workers, salespeople, and others. The treatment may be something you’ve never heard of before, and it can be hard to get good, unbiased information about it. Here we will go over what you need to know before you decide to try one of these unconventional treatments. We will give you some ideas about how to look at these methods and what questions you might want to ask as you think about what might be best for you. It may also help you find out more about the treatments that interest you. In this Medicine More Research should be accomplished in the coming months and years. The American Cancer Society considers Alternative medicine is used along with mainstream medical care. If carefully chosen and properly used, some of these treatment plans can improve the quality of life without causing problems with the regular cancer treatment. How Alternate Medicine is Helping What’s the Latest Development? Clinics that offer alternative medical treatments like Ayurvedic Medicine , Acuepuncture,and homeopathy are now eligible to receive federal funding in USA if they combine those treatments with traditional medicine. Some M.D.s are up in arms, decrying practitioners of alternative treatments as hucksters and con-artists. Such treatments, they say, have never been proven to work more frequently than the placebo effect whereas traditional medicine is supported by evidence from clinical trials. Author David Freeman says the picture is not so black and white and that even some highly respected traditionalists are reevaluating alternative medicine. The success of the medical establishment cannot be denied in its ability to combat infectious diseases. But the illnesses of today that pose the biggest threat to patient health are not easily remedied with vaccines and surgeries. Afflictions like heart disease, cancer and Alzheimer’s often respond better to lifestyle changes—ones that alternative medicines incorporate directly into their regimes—than to traditional medicine’s most sincere attempts at a cure. Procedures offered by traditional medicine typically respond to disease only after it has set in while alternative treatments can reduce risk factors associated with disease before they form. Explaining the demand for naturopathy in rural health: affinity with rural patients and populations The participants explained how their practice constituted a popular treatment option attracting good numbers of local and regional patients. As the quotes below illustrate, the naturopaths often made reference to what they perceived as the ‘open-minded’ and/or ‘independent’ outlook or approach of rural patients as a factor for demand for their services . I think country people are generally more open-minded and less cynical about things than city people… so I think they’re more willing to give things a go. I don’t think they’re exposed to as much of the negativity as city people, you know they’re not bombarded with media or advertising so they have to make up their own minds. Rural people brought up with this idea that you don’t seek help until the last minute and I think they enjoy the fact that you teach them to look after themselves rather than telling what to do. I really think that that preventative role of naturopathy can really help country people… they work themselves into the ground so much until… they die and they aren’t often able to get away from their farms to see you. So if you can teach them to look after themselves. they really appreciate that aspect. As this last quote suggests, the constraints and logistics of rural work and life may also be instrumental in establishing a convenient affinity between the preventive and empowering tenets of naturopathic care and the needs and abilities of rural patients with regard to accessing health services. ‘Some of these people are driving seven or eight hours to see a healthcare professional… [if the consultation only lasts for] 15 minutes and [costs] 200 bucks they get very disappointed… I think that’s why they like coming to see someone like us… we try to make the trip worthwhile. Rural Population have a larger sense of commitment. I’ve found that if I… include their family members and include their story… that’s half their healing…. They don’t get heard in the medical establishment because it’s 5 minutes, 15 minutes if they’re lucky, I’ve found that country people want to talk first. Likewise, the quote below pointed to the affinity with closer personal relationships among rural populations as cementing the demand for their naturopathic services. ‘They’re more inclined to see me because I listen and because I remember the story the next time they come or if I meet them down the street they will tell me and I have to remember those little pieces. it’s very different [from patient-practitioner relationships in urban communities]. ‘I definitely think that the fact that I’m originally from here made a huge difference… patients automatically feel more comfortable because they know you’re aware of issues that arise from living in the area. I think if I was someone coming up from the city they wouldn’t have been anywhere near as open to start with. ‘It’s always “she doesn’t listen” or “he doesn’t listen” or “they’ve always got their face on the computer”, or “how do they know me if they don’t talk to me”… There’s always a bit of a hinge first how the doctor treated them last time. people come to see me because I’m not a doctor. Western people are far more open… natural therapies have always been a part of their lives… some of the founding fathers of naturopathy started out in places like this… that culture is still alive here… it never died out. I mean they haven’t lost that part of their culture like people in the city have. However, not all explanations of naturopathic practice in rural communities were couched in entirely positive terms and as the next section of analysis outlines, there were a number of perceived challenges associated with providing naturopathic services to the wider rural community. Despite their overall presentation of Alternative Medicine and its sub sections as well suited to rural patients and populations. Several practitioners outlined how the resourcefulness and independence of rural people may produce challenges in providing timely treatment – a difficulty acknowledged as facing both conventional and complementary practitioners but were particularly a problem for working in the competitive private sector where treatment costs are entirely out of pocket and borne solely by the patient. As one Alternative Treatment Physician explained. I found people were much happier paying for the service Similarly, another Physician described how rural people are proud and how their self-reliance can be a challenge to providing care. This can be seen as the flip side to the positive affinity between a patient’s self reliance and a preventive approach as illustrated earlier by Alternative measures applied. need to feel in control and be central to decision-making in their healthcare, and how this influences her approach to providing care. Rural population is very strong, they do prefer their own counsel you can’t push them very much If they feel as though they are doing this themselves then you have their compliance. If you keep telling them what to do they don’t really want to know. So This population need Health Education and Health Promotion give them reading matter… handout sheets, they have a chance to go and think about t, seems to be a need to be in self-control. Conclusion: In conclusion the Alternative Methods by clubbing with Conventional Medicine and also with Health Education and Health Promotion are important to give better Health by adopting Fitness, Nutrition and Hygiene to the Rural Population.